Sponsored by The Department of Recreation, Cultural Affairs and Senior Services, the Mayor’s Office of Arts, Cultural Development and Tourism in conjunction with Mayor Baraka’s vision of a healthy, sustainable, eco-friendly Newark has developed the Eco-Wellness Garden of Peace and Tranquility curated within Newark City Hall. 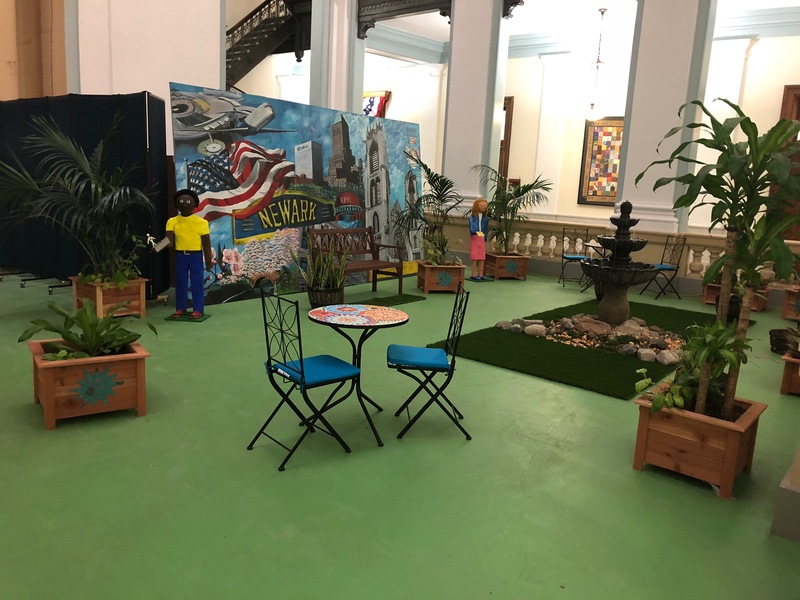 Aligned with the mission of the Office of Sustainability, this garden, with an array of tropical plants and trees, provides an indoor space to focus on wellness and environmental sustainability for Newark residents. The garden has wooden benches, a water fountain, bistro tables with chairs, and life-size dolls created by former 3rd-graders from Brick Avon Academy that are holding an array of earth-conscious symbols such as ‘pumps for fresh, clean water’,‘save the panda’, ‘doves for peace’, and ‘green earth’. In the garden, our residents will have a respite green space dominated by serenity and environmental awareness. Phase I of this project was curated by Tobias Fox,Founder and Managing Director of Newark Science and Sustainability, Inc, who will maintain the garden, plant and replant when necessary. The Office of Information technology will assist in providing nature sounds for Phase I. The sounds will aid in bringing a relaxed and peaceful setting to the garden. In collaboration with Home Depot, Phase II will bring an additional population of plants, tress and planters. Tobias Fox will provide free workshops focusing on health, environmental sustainability, and herbal wellness. Subtle technological additions will be introduced inPhase III. The Eco-Wellness Garden of Peace and Tranquility is located in the south atrium on the 2nd floor in City Hall.